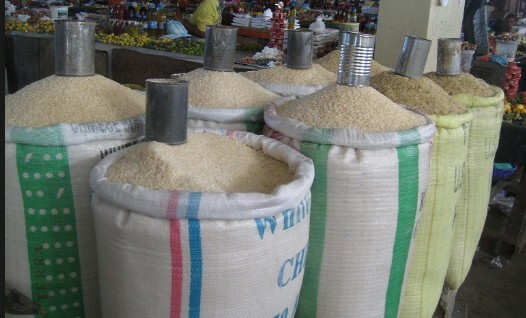 Local rice to sell as low as N6,000 per bag. Federal Government also promised to combat rice smuggling to boost morale of local farmers. The Rice Farmers Association of Nigeria (RIFAN) says it will reduce the price of locally produced rice from N18,000 per 50kg. bag to N6,000 within the next few months. This was disclosed in Abuja on Wednesday by Alhaji Aminu Goronyo, the National President of Rice Farmers Aassociation of Nigeria (RIFAN), during a meeting with Rice Processors Association of Nigeria (RIPAN) and the Minister of Agriculture and Rural Development, Chief Audu Ogbeh. Goronyo said that although RIFAN and RIPAN had agreed to fix the current price of 50 kg. bag of rice at between N13,000 and N13,500, the price would further crash to N6,000 within the next few months if there were bumper harvests and low cost of production. He said that the drastic reduction in the price would be made feasible if the cost of rice production was cut through the Federal Government’s support to rice farmers. “This is just the beginning. The actual price will still come down because we are expecting a bumper harvest this year; we have sat down with the millers and agreed that we will work together for the interest of Nigerians. “At one time, people were buying a bag of rice at the cost of N18,000 but they are now buying it at between N13,000 and N15,000. The price is coming down. “In the next few months, God willing, the price of a 50kg. bag of rice will come down to N6,000. It is achievable, it will be a reality,’’ he said. Alhaji Mohammed Abubakar, the Chairman, Rice Processors Association of Nigeria (RIPAN), said that the associations had signed a Memorandum of Understanding (MoU) to slash the prices of both paddy and processed rice. “We have agreed at N110,000 per tonne of paddy. In the market, rice will come around N13,000 to N13,500 per 50kg. bag. “Before now, we were buying paddy at N140,000 and N150,000 per tonne and we are selling our rice at N16,000 per 50kg. bag. “If this MoU works, we hope to sell a bag of rice at N13, 000 to N13, 500, depending on where you are in the country,’’ Abubakar said. Chief Audu Ogbeh, Speaking during the meeting, also promised the federal government’s support and readiness to partner with the rice farmers in combating smuggling and providing other conducive environment. “Let me express the appreciation of President Muhammadu Buhari and the Vice-President, Prof. Yemi Osinbajo, to both farmers and millers because nobody can calculate what you have done to rescue our country that was very close to disaster. “What you have done is going to save us from a lot of difficulties. What we want to promise you is that we will help you ease the burden of rice farming. “Last year, we procured 80,000 threshers; this year, we will procure another 2,500 threshers and we are bringing in small reapers for distribution to rice farmers. “The equipment will enable them to cut the rice, thresh it, winnow it and put it in sacks; It will take away all the stress which makes rice farming very difficult so that you can keep to the price of N110, 000 per tonne of paddy that we agreed. “If we are able to keep these prices stable and we are able to contain smuggling, I hope you will keep us informed when there are any challenges confronting you because no country can claim to be strong if its citizens are hungry. “Let everybody know that the price of rice for this Christmas will be good enough for us to eat rice, chicken and fish. “We just can’t afford hunger here. The smuggler will be the beneficiary of any violation of the price agreement you have reached,’’ Ogbeh added.